Perfect for skiing in the winter, right opposite the gondola station and ski schools. English and German speaking. Lots of outdoor activities the rest of the year, including hiking, lakes & mountains, cycling, white water rafting, paragliding, horse riding, scooters, to name just a few. The village has a fantastic outdoor pool, tennis courts, crazy golf, childrens' park. One hours drive south from the stunning city of Salzburg. Close to Zell am See lake for water sports and Kaprun for all year round skiing on the glazier. Ideal for both skiing and boarders. Beginners enjoy some of the best ski schools in Europe with German and English spoken. Perfect resort for family skiing. For the intermediates they can enjoy stress free, wide pistes with no queues. A wonderful snow paradise. Visitors come back year after year. Main cable-car station two minute walk (no bus trip needed!). New ski gondola now open, new ski runs available. Wonderful restaurants for lunch and to take in the breath taking alpine views. Costs on the mountain are surprisingly reasonable. For the more daring, there is a black run into the village, also there are some of the largest ski areas in Austria are also within a 20-40 minute drive including Kitzbuhel, Zell am See, Heiligenblut, Bad Gastein, Flachau, Saalbach, St Johann and the Kitzsteinhorn (Kaprun) Glacier, which provides skiing 365 days a year! The summit is at 2200m and runs all the way down, via 36 km of excellent skiing to the resort at 950 m.
There are three gondolas that carry you to the summit, 3 t-bars and one chair lift. A cross country skiing trail passes directly in front of the Mountain Resort, providing access to 40 kms of cross-country tracks in the Rauris valley. The modern apartment is very well equipped with a open plan living area, 2 double bedrooms, one with king size bed, one with double bed and the 3rd bedroom with set of bunk beds. A put up bed can be arranged for another small child. Free use of the onsite Schönblick Mountain Resort Spa & Pool, FREE wi fi and also your own private underground parking space. 2 separate bathrooms. 1 ensuite bathroom with shower, 1 main bathroom with bath/shower and 1 separate WC. Kitchen is modern with microwave, dishwasher, oven & hob, fridge/freezer and Nespresso coffee machine. Two large bi-fold doors open out onto the wrap around balcony. Garden furniture supplied so you can enjoy the sun and views for most of the day. Relax in the onsite spa and enjoy the Sauna, Steam room and Infrared cabin for those aching muscles. Take a dip in the 20m heated pool, or just lay back on a lounger and take in the views. There is an onsite gym for those that want to keep their fitness levels up whilst on holiday. Underground car park space and boot room. Free Wi-fi, 32' Plasma TV, DVD player. Nespresso coffee machine. The Spa, gym, boot room, laundry room and Restaurant can be accessed via underground. Being on the ground floor makes this apartment very child friendly so the children can play in the open space outside, whilst you relax on the raised balcony. Baby cot and highchair can be supplied at an additional cost. 1 set of bunk beds. 2 bathrooms – main bathroom with bath, double sinks and shower. 1 Separate toilet. En-suite bathroom to main bedroom. For a small village Rauris has great facilities. A two minute walk into the centre of the village, with numerous places to eat and drink. Two supermarkets to stock up on all you need. A fabulous outdoor pool with views down the valley, outdoor and indoor tennis courts, crazy golf and a park which are all within walking distance. It makes an excellent location for both summer and winter holidays for the whole family. Lots more activities are available near by. The Rauris Valley is perfect for outdoor enthusiasts as it offers a multitude of sporting and leisure activities all year round. On your summer holiday you can enjoy 250 km of unspoilt hiking and cycling trails. Drive up the near by Grossglockner (tallest peak in Austria) to see the stunning views of the Austrian Alps. Take a 12 km drive to the picturesque town of Zell am See and enjoy the many facilities around the lake, including water sports. White water rafting available in near by Taxenbach. For the more adventurous, a hike to the Zittelhaus, the highest weather station in Europe and stay the night above the clouds! Indoor climbing walls are a great day out for all the family, no experience necessary. Near by you will find several Thermal Spa's full of family enjoyment, relaxation and fun. All have indoor and outdoor swimming pools, spa area, adults only quiet areas. You can enjoy watching the mountains in the warm outdoor thermal pools all year round. As a family we love the outdoors. Skiing in the winter and cycling and hiking in the summer. We love stunning scenery and Austria definitely has that! We visited Rauris for a number of years, skiing in the winter and exploring in the summer. We loved the endless amount of walks and cycle routes to explore. The stunning scenery still takes our breath away. We decided to purchase an apartment on the Schonblick Mountain Resort because of the amazing onsite facilities, with the added benefit of being a few minutes walk into the centre of the village. Skiing gondola and ski schools are opposite, so no bus rides! Also near aprés ski. Onsite spa & pool, great for relaxing after a long day on the slopes. Eva Maria 2 is a ground floor apartment with a raised wrap around balcony, having the benefit of sun most of the day. Included is an underground parking space, onsite laundry room, boot room and gym. Rauris is in National Park, therefore is not over developed. The scenery in breathtaking. A stunning traditional Alpine village with all the modern facilities needed for a very enjoyable holiday. 2 minutes walk into the centre of the village, with numerous restaurants and bars. Rauris is a wonderful place to have a holiday with so many activities to try, or to use as a base to visit the many wonderful places. Zell em See has a lovely lake and is only a short drive. Salzburg for shopping and site seeing is an hours drive north. Visit the Eagles Nest (Hitlers holiday home) for some culture. Communal washing machines coin operated. Washing powder not supplied. Communal dryer in laundry room, coin operated. Sorry there are steps to the apartment, so not suitable for a wheelchair. Onsite 25m indoor pool, sauna, wet room and infrared cabin. Accessed under or over ground. Our apartment sleeps 6 comfortably. We may consider an extra small child to bring the number up to 7. A charge is made for cot or put up bed. We had a lovely stay at Helen's apartment. It is spacious and has everything you need, and really cosy with all the snow outside! I think it would be lovely in summer too as the doors in the lounge all open up and there is a terrace. Having the underground parking space and access to the swimming pool was also a bonus. The pool is now open from 10am not 3pm as it was before, so it is more flexible for non-skiers. It was so close to the ski school that we were able to come back for lunch. And the valley is beautiful! It was a great place for our first family ski holiday. So glad you enjoyed your visit to Eva Maria 2 and made good use of the onsite pool and spa. Yes you are right about the summer, Rauris is a wonderful place for a summer visit, in fact any season of the year has something to offer. Hope to see you back again in the future. 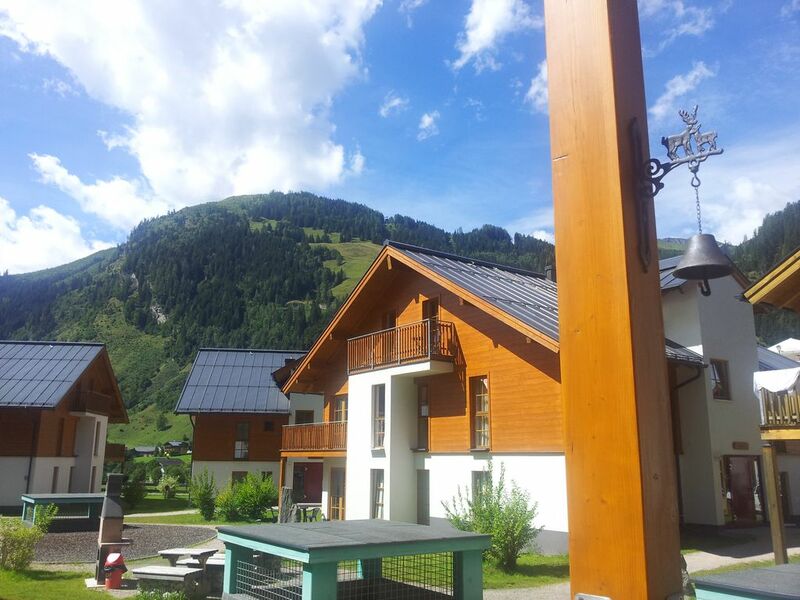 The location of the property is perfectly placed, less than 10 minutes walk into Rauris centre. It was extremely well equipped and decorated to a high standard, in keeping with its surroundings. It was clean and the beds were very comfortable. You have private parking and free access to the onsite pool and sauna, which we used daily. The views were stunning at the height of the Summer, and can imagine it is equally impressive in the Winter. We have been in contact with Helen prior to the holiday, and she was very helpful in all her advice with regards to activities...we travelled with 2 children and wanted a mixture of relaxation and things to do, and found this a perfect choice. I would highly recommend and hope to return in th future. We are so glad you enjoyed your stay in Rauris and found the apartment to be in a great location, close to the centre and enjoyed the wonderful views. Also that you made good use of the onsite spa and pool. You are right the area is also stunning in the winter, there is so much to do in area and we would love to welcome you back in the future. A beautifully clean, contemporary apartment with lovely Austrian character. Perfectly located to access the picturesque slopes during the day and the tasty restaurants in the evening. A short walk to all local amenities. A definite must. Thank you for your lovely review. We are glad that you enjoyed your stay and hope to welcome you again in the future. Apartment is perfect for a Skiing holiday. Under floor heating gives a lovely warm welcome when you return from the slopes and masses of hot water means no-one is unable to shower or bathe. Everything is clean and tidy and you can cook efficiently in the kitchen. We hadn' t skied for 23 years, but it really is like riding bike!! We will be back ! Amazing holiday from start to finish! Amazing holiday from start to finish! Wish we would of booked longer as we didn't get chance to do all the things we wanted to do. The views are breath taking (no matter what time of day or the weather). The apartment is very spacious, clean and comfortable. Perfect to chill out watching DVDs, playing cards and catching up with friends whilst the kids sleep. The management staff were very helpful and always obtainable. The onsite pool is open in the afternoon so came in handy after a long day walking and sightseeing. We visited the gondolas, Salzburg zoo, Salzburg town (using park and ride) zel am see, national park and weixen restaurant. The local amenities are accessible and very close to the apartment. The local restaurants are good (although if you are not a fan of salt on your food you need to request as food is very salty everywhere)! The outdoor pool is very entertaining for children and good for the adults to relax (and catch up on sunbathing)! We thoroughly enjoyed this holiday and are planning another visit in the next few years to complete everything we wanted to do. This section provides you with some useful contacts and information regarding things to do within and around Rauris to suit all taste and ages. If you do require any further information on what you can see and do in Rauris you can visit the Tourist Office (Tel. 0043 6544 20022) website www.raurisertal.at Tourist Offices in other towns can provide equally excellent information. There are many annual traditions in Austria which are celebrated at various times throughout the year: A weekly listing is available from reception or from the Tourist Office. The beautiful Kolm Saigurn at the end of the valley is equipped with several beautiful waterfalls, there is easy and difficult courses to follow and something for all tastes. You can find a minigolf course in Rauris. It is situated up the road behind the church. There are tennis courts in Rauris. These are located in the Sportstrasse near the SPAR Supermarket. For court reservations please visit the facility. Rauris has a 12th century Schnapps commercial distillery, which is located a few kilometres from Rauris, past Worth at the Gasthof Kirchenwirt. Here fruit schnapps is made from just about everything. An enclosure is also situated there so you can see deer, marmots, rabbits, goats etc. For further information please contact the Tourist Office. During the winter months and subject to snow conditions there are several operators offering horse drawn sleigh rides. For any further information please contact them directly. Drive down the valley to the Bodenhaus, park in the public car park. From far end of the car park look out for the path that takes you over the stream. Follow the red/white flag like signs painted on trees and rocks. Walk up to the Panorama Alm. It will take about 1:45 hours, but it is well worth it. On your way up, turn off to see the waterfalls which are sign posted on the left. Reward yourself for the effort with a bowl of wonderful goulash soup. Views are amazing! Past the Bodenhaus you will find the entrance into the National Park. Pay for the car park and there are numerous walks to follow. There is a Rauris tax of €2.00 per person per day (over 15) payable in cash at the resort, guest discount card will be supplied by my Representative from Wright Property Services. Final clean, bed linen & towels are included. Use of the spa is free - A €5 deposit may be payable at the resort for spa pass. Apartment will be checked prior to your departure and refunded within 7 days if found to be satisfactory. .